With more and more men turning to DE shaving as a way of getting a close luxurious shave while also saving some money, a shaving kit makes a great gift for almost any man on your shopping list. However, when purchasing a shaving kit as a gift you want to find the best shaving kit for men that you can afford. 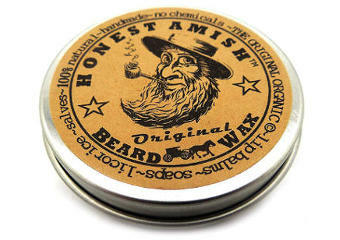 So, here is a look at some of the best high quality shaving kits in various price ranges. 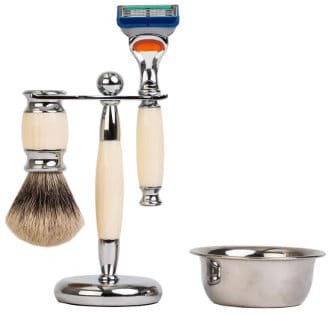 The Van Der Hagen Men’s Luxury Shave Set is a 4 piece set that features a 100% pure badger brush with a razor stand, a monogrammed apothecary mug and a shave soap which is hypoallergenic. The brush handle and the mug is a nice black color and the brush stand is made of clear acrylic. This is a low priced set which makes a great starter kit for those who are new to DE shaving or who want to try DE shaving for the first time. It includes all the basics with the exception of the razor. Users find the cup to be very attractive and useful though the nub handle makes it difficult for some men to hold. The soap has a nice aroma and creates a nice protective lather while the brush is not the best quality, but works well for a starter set. Although the stand lacks sophistication, it is extremely functional, holding the razor safely and allowing the brush to dry properly. Because this kit is inexpensive, it makes for an ideal exchange gift or stocking stuffer for Christmas as well as a great father’s Day or birthday gift. 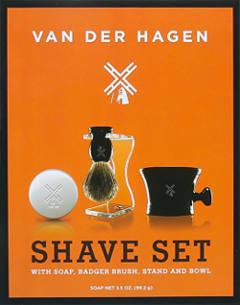 The Van Der Hagen Premium Shave Set is an extremely inexpensive 3 piece shaving set which is perfect for those who want to try DE shaving for the first time but don’t want to break the bank. As a great starter set, it includes a 2.5 ounce of hypo-allergenic shave soap with moisturizers, a ceramic bowl and a 100% natural boar bristle shaving brush. Although this is such an inexpensive kit and may not be the top of the line, it is highly functional and users think that the brush is well worth the price of the entire kit. 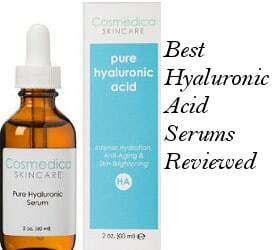 It lathers well, feels good on the face and while it is not high enough quality to last for years, it should last several months until you decide if DE shaving is for you. The soap has a nice extremely light scent that will not compete with your aftershave. The bowl is useful if not fancy. While this gift set may not be the right choice for those who have been DE shaving for years, it is the perfect starter shaving kit for newbies to the world of wet shaving. The Merkur company is known for their high quality razors, so no Merkur shaving gift set would be complete without including one of their DE razors. This Merkur Shaving Set is a five piece kit that includes a long handle #180 safety razor, a bowl, a badger brush, a soap and a stand. It is chrome plated which makes it attractive sitting on your bathroom vanity. The overall set is of a nice quality. The safety razor is high quality while the bowl is a little shallow yet functional. The soap is a glycerin based Colonel Conk soap that does not create a thick lather but does protect your skin during the shave. The badger brush is of good quality and the stand allows your brush to dry properly. 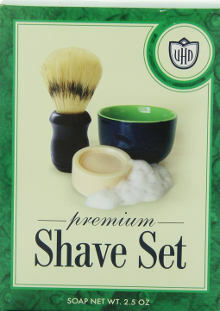 While this is a fairly expensive gift set, it does contain everything you need to begin DE shaving if you are new to it. However, it also makes a nice gift set for those who have been wet shaving for some time. 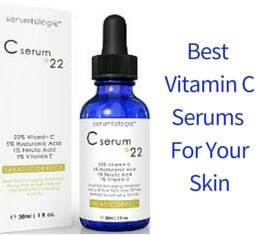 Overall, it looks like an attractive and thoughtful gift that is perfect for men of all ages. 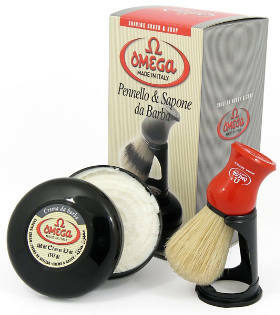 The Omega 46065 Shaving Set is an inexpensive 3 piece shaving set made in Italy. 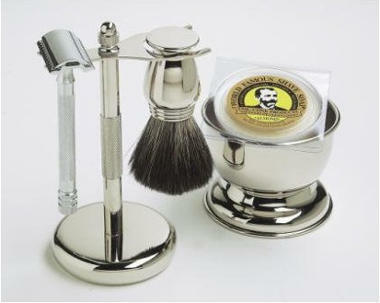 It features an Omega boar brush, a shaving soap in a plastic bowl and a shaving stand. Although this may be a budget priced gift, the set itself is reasonably attractive. While the plastic shaving bowl is less than sophisticated, the soap inside lathers well and has a great scent. The boar shaving brush is of good quality and works well feeling good on the face. It does however shed somewhat. The kit itself is small enough to make a good traveling kit and it is suitable for a wide range of users of all different ages. What this kit lacks in sophistication, it makes up for in functionality as you aren’t paying for stylish looks but simply for the good quality of the products. Some users are actually surprised at how durable this kit seems to be, stating that it may well last for several years. This is really a good starter kit for those wanting to try their hand at wet shaving for the first time. If you are looking for a classy shaving set to give as a gift to any man on your shopping list, the Fento Deluxe Shaving set should do the trick nicely. This sophisticated 4 piece kit is somewhat expensive, but features a razor that comes with a fusion-5 blade, a 100% badger brush, a stainless steel bowl and a stand that holds both the razor and the brush keeping them safe, neat and tidy. The handles on the razor and the brush are stainless steel and faux ivory, presenting an attractive look when sitting on a shelf or your bathroom cabinet. Not only is this set extremely attractive, it is also a nice weight and highly functional. This is the type of shaving set you will want to give to that special man in your life as both its quality and the looks make it really something special. Users really like this set and state they are proud to own it. The Luxury Shaving Gift Set is a 5 piece gift set that has everything you need to begin your DE shaving adventure with. In particular, it consists of a long handle Merkur razor, a shaving cream, a badger brush, a stand and a Proraso liquid after shave cream. It is chrome plated, extremely attractive and perfect both for beginners as well as long time wet shavers. It looks great displayed in your bathroom and is as functional as it is attractive. The Merkur razor is the high quality you would expect to see from a Merkur shaving product while the brush is 100% boar bristle and good quality. The shaving cream is the Taylor and Old Bond Street Sandalwood shave cream which has a nice clean and pleasant scent. The after shave has just the right amount of sting prior to that cooling feeling men love. Users find every item in this set to be of a high quality and the brush, razor and stand to be nicely weighted making them feel substantial in the hand. Although expensive, this quality kit is a set that most men would be thrilled to receive as a gift or buy on their own. Unfortunately, it is currently unavailable on Amazon. In conclusion, when looking for the best shaving kit for men to give as a gift or purchase for your own use, you simply couldn’t do much better than selecting one of the best shaving kits for men in this review.